ANG RITA SHERPA is a native of Khunde Village, Khumjung - 5. 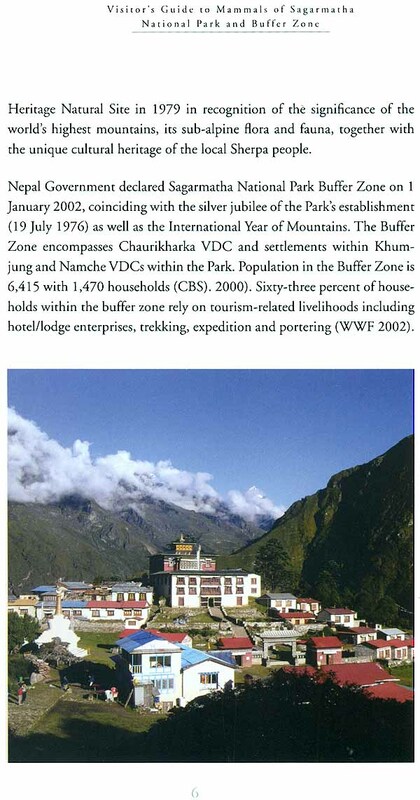 Mr. Sherpa has dedicated himself to the management of remote mountainous aned protected area. He has been involved in conserving eco-system while enhancing sustainable livelihood for mountains comunities. Mr. Sherpa receoved his Msc. Protected landscape Management from the University of Wales, UK in 2001 and an undergraduate degree in Parks, Recreation and Tourism Management from Lincoln University in New Zealand. He has also served as Volunteer in Park Service at yellow Stone and Grand Teton National Park in 1987 and later at Shenandoah and the Great Smoky National park in 2002 in the US. He has received the Sir Edmund Hillary Mountain legacy medal in 2011 for his dedication to the conservation and development over more than two decades. He is the Chairman of Himalayan Trust Nepal established by Sir Edmund Hillary in 1964. Mr. Sherpa is the Chairman of the Partners Nepal, President of Everest (Sagarmatha) Chapter, for Nepal Mountaineering Association (NMA), and Vice President of Everest (Sagarmath) Chapter for climate Alliance of Himalayan Communities (CAHC). He is the founder member of Mountain Sprit, advisor of CAHC and an executive member of Khumjung School Alumni Association. I am very pleased m know that Mr. Ang Rita Sherpa, a native of Khunde, a tiny Sherpa village in Solu-Khumbu district of Nepal, is publishing "The Visitor Guide m Mammals of Sagarmatha National Park and Buffer Zone" m mark the 40th Anniversary of the Sagarmatha National Park. I am acquainted with Ang Rita since long while I was working as the Warden of the Sagarmatha National Park, a World Heritage Site in early eighties. He had worked with me as a Tourism Development Officer while I was Project Manager of the Makalu-Barun National Park and Conservation Area Project, a joint adventure of the Government of Nepal and The Mountain Institute in early nineties. I found him very hardworking and sincere m his work. He has made significant contribution m biodiversity conservation and promoting nature based tourism in the mountain protected areas. It is no wonder m me because of his dedication and hard working nature m produce this booklet in blending conservation with tourism for the benefit of the visitors coming m Sagarmatha National Park. Therefore, this Visitors Guide booklet by him is a very welcome addition m conservation and tourism. 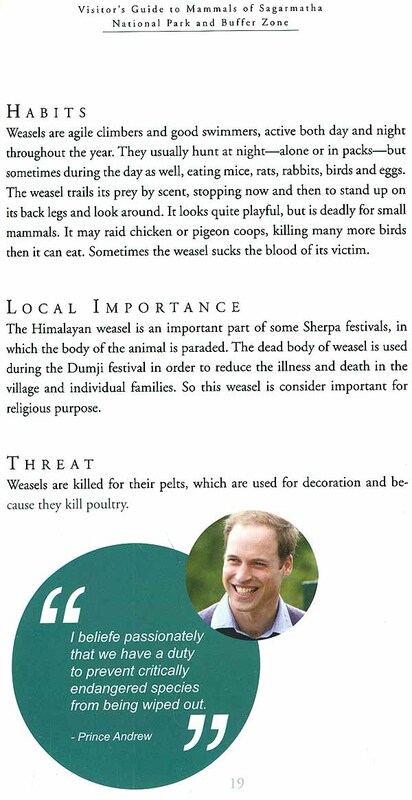 This booklet is more like a field guide m identify mammals fulfilling the niche of the protected area visitors. I am confident that this booklet will certainly enrich the experience of both national and international visitors coming m this protected area rich in natural heritage by learning the conservation situation of several types of mammals found in the area and how they are living in harmony with the local inhabitants in the high mountains. Once again, I welcome this work of Mr. Ang Rita for his significant contribution m wildlife conservation and congratulate him on the publication of this booklet. It gives me honored to write foreword for this booklet on mammals in Sagarmatha National Park to be authored by Ang Rira Sherpa on the occasion of 40th Anniversary of the establishment of the world's highest Protected Area. I had the privilege to serve as the Park Warden of Sagarmatha National Park that includes the world's highest peak of Mount Everest. The Park was established in 1976 to preserve and ptotect the high mountain ecosystem with its flora and fauna including the local Sherpa cultural heritage. Owing to its unique natural landscape blending together with the local indigenous Sherpa population, the park was declared a world heritage site in 1979. 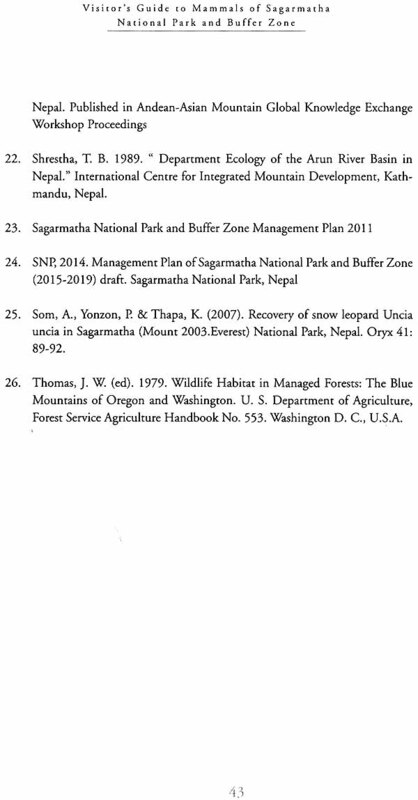 It also gives me pleasure to announce that the Sagarmatha National Park Buffer Zone was declared in 2002 during my tenure as the Chief Conservation Officer to commemorate the International Mountain Day. The declaration of the Buffer zone allows 30-50 percent of the park revenue for community development. Besides the high mountain landscape, Sagarmatha National Park also provides prime habitat for endangered wildlife species such as Musk Deer, Snow Leopard and many species of birds. Visitors to the park can observe the sighting of Musk Deer, Himalayan Tahr and Impeyan Pheasant (Danphe). The elusive Snow Leopard has been recently sighted due to the conservation efforts of the park staff and local community. 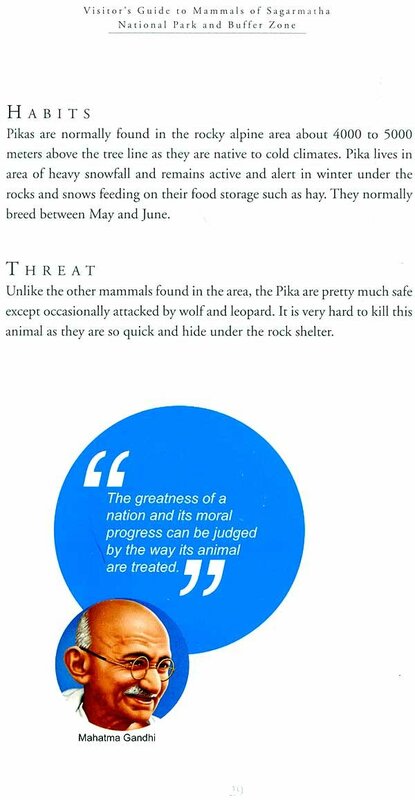 I am sure that this booklet on the Mammals of Sagarmatha National Park written by Ang Rira Sherpa will enhance the importance for the preservation of wildlife for the visitor's enjoyment. This booklet will also help to promote wildlife tourism in Sagarmatha National Park whereby the younger generation local people can gain employment as a natural wildlife guide. I am glad and proud that Sagarmatha National Park has entered its 40th Anniversary. While I was a young boy living in Khumbu, I would come across tourists near my village of Khunde, who seemed to get inexplicable thrills from finding seats between Khunde and Syangboche. On many occasions, I was asked if I knew the animals the seats belonged to. At that time, my knowledge on these animals was very limited. I had only seen some jackals (Kipchang) during the dusk. I also remember the Himalayan grey wolf (Changur) that killed yaks near our village. While I couldn't be more informative for these travelers back then, their curiosity and excitement over mere seats in place seeded an interest in me to be more attentive to the world around me. Over the years, this interest evolved into a full blown passion and consequently, a career in conservation. Sagarmatha National Park has seen many books written about the overall park, Sherpa culture, flora and fauna. However, there haven't been any books written about the mammals found in the park. 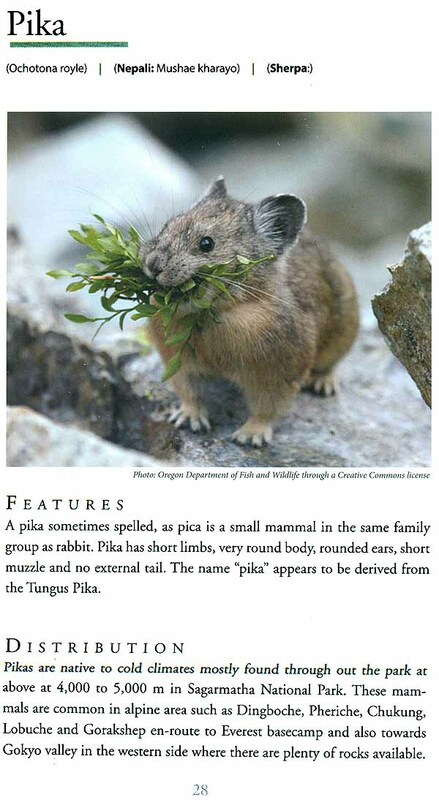 Recognizing this fact motivated me to create a guide to mammals found in the park. opportunity to assist the Rapid Assessment Program Makalu-Barun National Park and Buffer Zone in 2005 headed by Dr. Leanne A1onso the former director of Rapid Assessment Program at Conservation International. 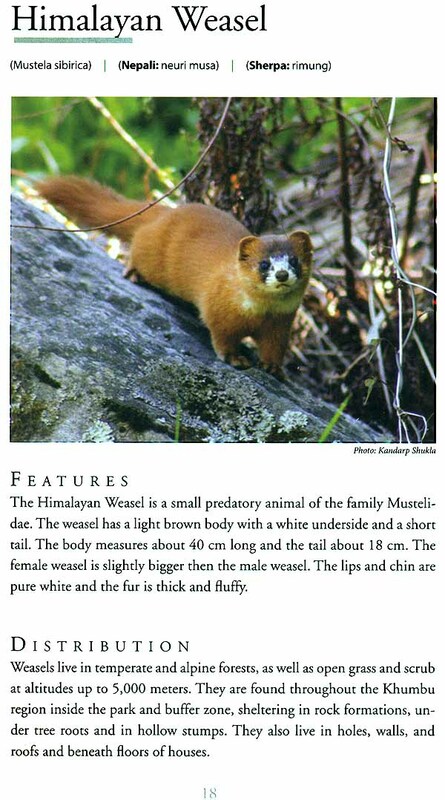 The Visitors Guide to Mammals of Sagarmatha National Park and Buffer Zone is a brief guide to the mammals most likely to be encountered in Sagarmatha National Park and Buffer Zone located in the Solukhumbu district of eastern Nepal. 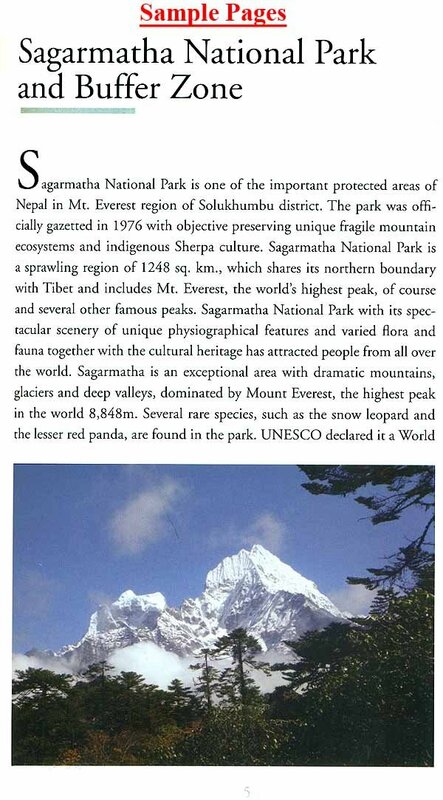 This guidebook is intended to allow the national and international visitors coming to the Sagarmatha National Park and Buffer Zone to have a richer experience of the natural surroundings of the place by learning about the types of mammals found in the park, their distribution, habits and their significance and threats to local inhabitants. Nowhere else in Nepal does one find such biodiversity and rich mammal fauna. This region houses a number of endangered species such as snow leopard and musk deer as well as other commonly sighted species such as the Himalayan black bear, common langur monkeys and tahr (wild goats). 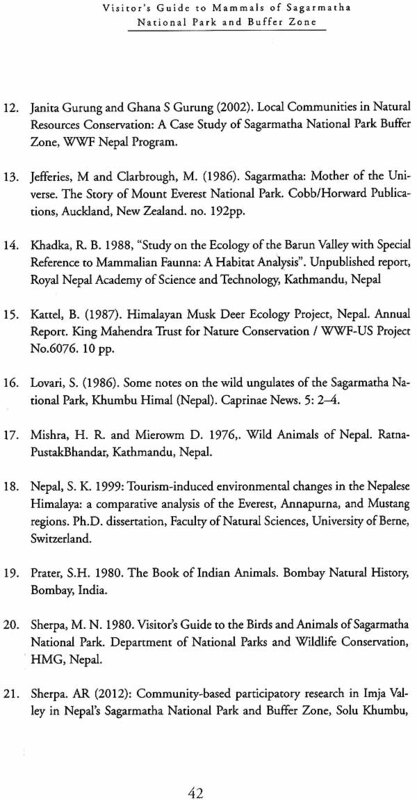 This year marks 40 years of establishment of the Sagarmatha National Park since 1976 and I am very excited to be publishing the "Visitors Guide to Mammals" of Sag arm at ha National Park and Buffer Zone on this occasion.